Bob Hoskins stars as the hard drinking hard boiled detective investigating a convoluted case in Toon Town, in a groundbreaking combination of live action and animated film. 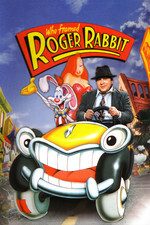 Looking around for something to watch with my feverish kid tonight we settled on Roger Rabbit. She loved it more than I did when I watched it at age 14 (!!) - I think I was too old to love the cartoons and too young to get some of the jokes? I liked it better this time. Bonus points for the streetcar conspiracy/anti-car culture messages, but the real smart part, beyond the animation which was great, was the noir part. Having just watched The Big Lebowski for the first time and reading the discussion about that film here, I was struck by how much more I liked this take on the genre. It pays loving homage but pokes at the cliches in clever (if fairly unsophisticated) ways. For whatever reasons, my kid keeps gleefully repeating the nice booby trap line. Also, Kathleen Turner was uncredited, right? Anyone know why? I LOVED the book. It's different but SO GOOD. If you like the movie you should read it—as a totally separate entity. Love this film. Its such an odd little thing that almost shouldn't exist, and is just really good at what it does. Incidentally, the deleted scene for this film is worth tracking down, as it is massively creepy and quite gross. I seem to remember being quite surprised by the twist at the end of the film, and also being quite scared: I was pretty young at the time. Yeah, that final scene with the dip cannon is really scary for children. Fortunately kids tend to like scary more than we usually think they will. Roger Rabbit's a great film. Very little quite like it. Eddie's song-and-dance didn't make sense to me, until I watched it again, and noticed in the slow pan over his office there's a framed photo: "TED AND ED ON THE ROAD WITH DAD" (or something like it): two boys and an older man in clown makeup, under a Ringling Bros. - Barnum & Bailey sign. Everything in this movie fits. Everything has a place, and everything serves to move the plot, develop a character - to tell the story. No wasted pieces. Or to put Bugs and Mickey in the same frame, which is just as worthy a goal. %n: "Also, Kathleen Turner was uncredited, right? Anyone know why?" This is pure speculation, but I wonder if they did it to reinforce the illusion of the toons as "real" people that existed outside of the world of the film. Since Turner was the only true celebrity actor in the voice cast (apologies to Charlie Fleischer), her credit was omitted to make it seem like Jessica Rabbit was simply a real live toon actress playing a role. I watched this when I was 11, but I am not afraid to admit that at 14 I was unapologetically into cartoons. At 14 I was probably watching Eek! The Cat, Animaniacs (I loved the Pinky and the Brain segments but the rest was kind of obnoxious IMO), and the Flinstones which were still being re-run. I still love them if they're done right and not all stupid CG 3D garbage, and the Roger Rabbit universe was clearly in the mold of Looney Tunes, which I still like a great deal. I saw this in the theater at least three times when it came out. It was like Zemeckis had made movie just for me. Who knew that you could throw all those wildly disparate styles and themes together and make it all work? It's just an amazing deft feat of juggling to make that all work and to make it look somehow effortless and technically astounding at the same time. The link called, "The world of Who Framed Roger Rabbit is seriously messed up" talks a little about how the racism allegories play out in the movie. To take the analysis a bit too far: I think that part is interesting because although it portrays an apartheid system, there is no in-depth exploration or critique of that. Separately, there's an early scene where Eddie hitches a free (illegal) ride on the back of a Red Car and ends up sharing cigarettes with some kids there. I can't imagine seeing this scene in a contemporary movie: portraying kids smoking cigarettes seems just impossible now. The movie is sort of morally neutral while still having this overall message of the good guys should win and we should protect the vulnerable. My kid was really put off by Judge Doom turning out to be a 'toon and she thought it was like a cop out. She was saying that people don't want to think that we'd do something evil like that - only a 'toon - but people do evil stuff all the time. Be that as it may, I love that the movie makes it a central part of the plot that the only person who could possibly have come up with the Los Angeles highway system is a genocidal cartoon supervillain. There was a lot of love for WFRR in the Bob Hoskins obit thread. So good in this; not just because he pulls off the "acting against a tennis-ball-on-a-stick" thing long before it became a Hollywood job requirement, but also because he's so fully committed. He IS Eddie Valiant. I remember seeing a behind the scenes doc which showed the diner scene, with the plates Roger smashes over his head being actually smashed by a robotic arm, so there was almost certainly 'painting over live action/puppeteering with toons' going on in the production of that film. I watched this for the first time since I was a tiny child last night. I knew that the Dip really freaked me out, but apparently I had completely blocked out that ending bit with Judge Doom. There's not an emoticon for the face I made, but I'm pretty sure I had nightmares last night. The thing with the eyes-- Jesus that was disturbing. I also kind of forgot about the technical wizardry halfway through, because it was so engrossing, and so well put together. I can forgive Zemeckis Forrest Gump, for this movie. Following up from dogheart, I've just rewatched this for the first time in decades. Holy hell this is an amazing movie. Just magical. They don't make them like this too often anymore. What are some movies that would accompany Roger Rabbit well? I watched a bit of the recent Jack, the Giant Killer on TV the other day and was amazed at how fake the actors looked in the interactions with the CGI giant. Their eyelines didn't seem to match right at all and they didn't seem to be in the same space as the giant. Twenty five years after Roger Rabbit some filmmakers still can't seem to make animated character seem real. Pope Guilty: "What are some movies that would accompany Roger Rabbit well?" I feel like Pee Wee's Big Adventure pairs well, insofar as it goes with the whole '80s leitmotif of baby-boomer auteurs working out their postwar-childhood issues through pop culture metaphor. Also, Roger Rabbit is all about cartoon characters who behave like people, and Pee Wee is all about people who behave like cartoon characters. I've never seen Chinatown, but maybe it's time as I guess Roger Rabbit's plot is based on that. There are similarities, but the Roger Rabbit plot is a little more clear, at the end, than Chinatown's. But in Chinatown you get to see Polanski knife Nicholson.